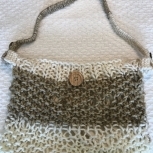 Women’s summer tote. (Color: Yellow/Grey/White. Accessories: Grey/White ribbon, Grey/White buttons. 100% Acrylic. (Views: front, back, inside lining cotton fabric, side straps).Size: Approximately 18.5W x 14L. Straps with button side loops are approximately 36 inches long.